Is HBO trying to steer Golovkin away from Chavez Jr? By Jason Kim: If you had the chance to watch HBO analyst Max Kellerman’s interview with WBA World middleweight champion Gennady Golovkin last Saturday night you’ll notice that instead of asking the logical question to Golovkin about whether he’d be interested in facing the winner of the fight between WBC middleweight champion Julio Cesar Chavez Jr. and Sergio Martinez, Kellerman instead asked Golovkin if he’d be willing to fight the winner of the September 8th fight between WBA/WBC super middleweight champion Andre Ward and Chad Dawson. Golovkin looked stunned by the question, but answered reluctantly that he’d be willing to fight Ward, but it was pretty clear that wasn’t the opponent he was expecting Kellerman to ask him about. 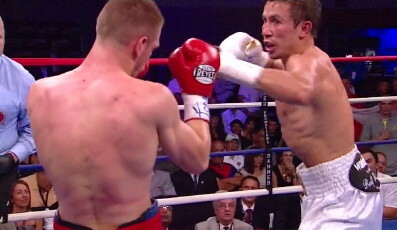 It’s hard to figure out why Kellerman mentioned Ward rather than Chavez Jr. or Martinez for Golovkin. All I could think of was that Kellerman and perhaps HBO might not be interested in seeing Golovkin fight the winner of the Chavez Jr-Martinez fight, especially if it’s Chavez Jr’s comes out the winner of that fight. It’s well known that Chavez Jr. brings in big ratings for HBO, and it probably wouldn’t be a good thing for Golovkin to expose Chavez Jr. by facing him and knocking him out. Having Golokin take down Chavez Jr. might not be a good thing for HBO, because Golovkin isn’t a well known in the United States and it’s possible that he’ll never be as popular as Chavez Jr. is now even if Golovkin were to dominate the middleweight division for many years to come. Chavez Jr. has a large Hispanic fan base courtesy of his famous father ex-boxing great Julio Cesar Chavez Sr. Golovkin doesn’t have any of that and he has to win fans the hard way by impressing one fight at a time. Is HBO or Kellerman looking to sacrifice the less popular Ward to Golovkin rather than Chavez Jr? I don’t know but it was awfully weird that Kellerman seemed to be trying to steer Golovkin into a fight with the Ward-Dawson winner rather than the Chavez Jr-Martinez winner. Boxing » Gennady Golovkin » Is HBO trying to steer Golovkin away from Chavez Jr?